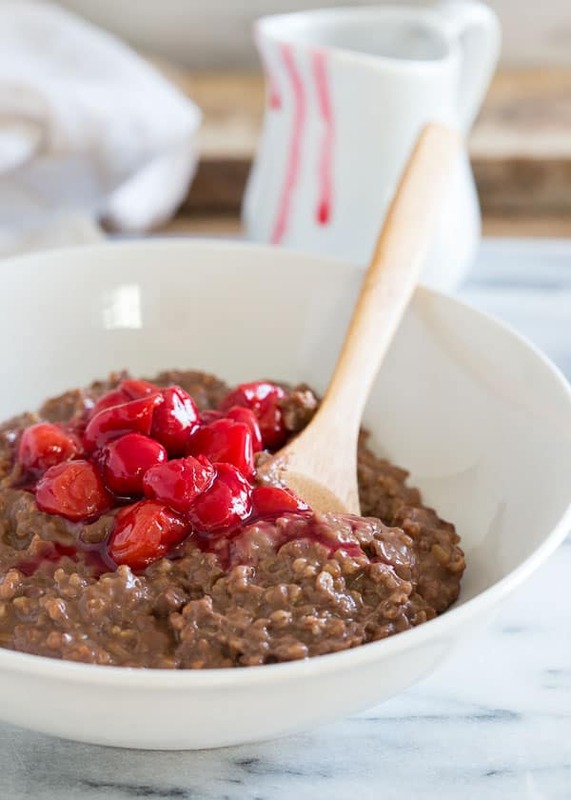 This slow cooker chocolate cherry steel cut oatmeal is waiting for you when you wake up in the morning. Start your day with a delicious comforting bowl for breakfast. There’s a slow cooker category on this site and after almost four years, it has a whopping six recipes in it. For a “small” appliance that takes up an entire shelf of a corner cabinet, that’s pretty pathetic. None of them happen to be breakfast recipes either and after a week of single digit temperatures and a freezing cold house in the morning before we get the wood stove going again (because of course the year we get a wood stove to offset the insane cost of heating a house in NY, the price of oil plummets), I could really get behind an already cooked comforting breakfast that I can eat under my wool blanket on the couch with a cup of coffee. Since it happens to be National Oatmeal Month (yeah, that’s a thing apparently), slow cooker steel cut oats seemed like the perfect solution. A boring bowl of beige oats didn’t seem too exciting though which is exactly where dark chocolate and cherries come in. Any morning that starts with chocolate is a win by me but adding cherries and not just any cherries, but deliciously tangy and good- for- you tart cherries, makes this breakfast even better. Montmorency tart cherries (sometimes known as sour cherries) are rich in vitamin A and pack a nutrient punch to your breakfast that’s just an added bonus to their amazing sweet and sour taste. The combination of chocolate and tart cherries in this recipe is like taking a bite of black forest cake with every spoonful. Cake for breakfast? Um yes, please. 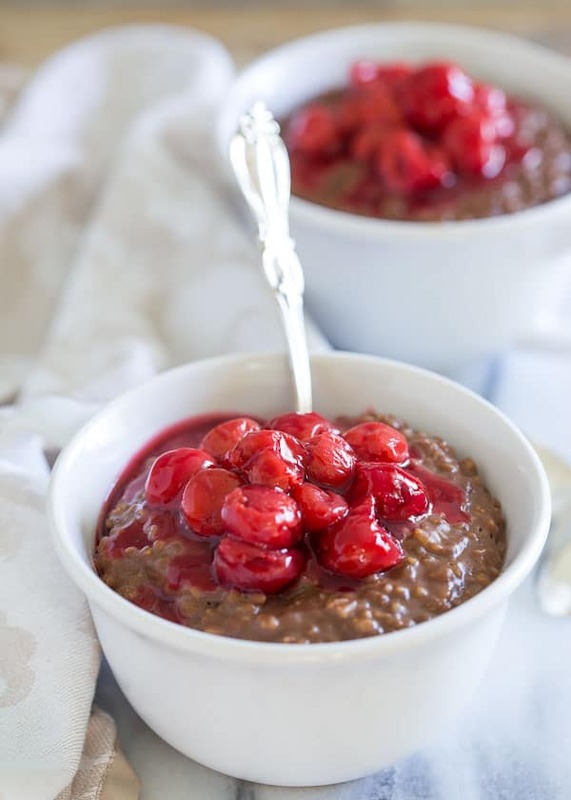 So while these cherries are great in everything from smoothies, to drinking the tart cherry juice straight up or even throwing them in your bowl of cereal, I’ll be cozying up with a bowl of this comforting chocolate cherry steel cut oatmeal until the temps reach at least freezing again. 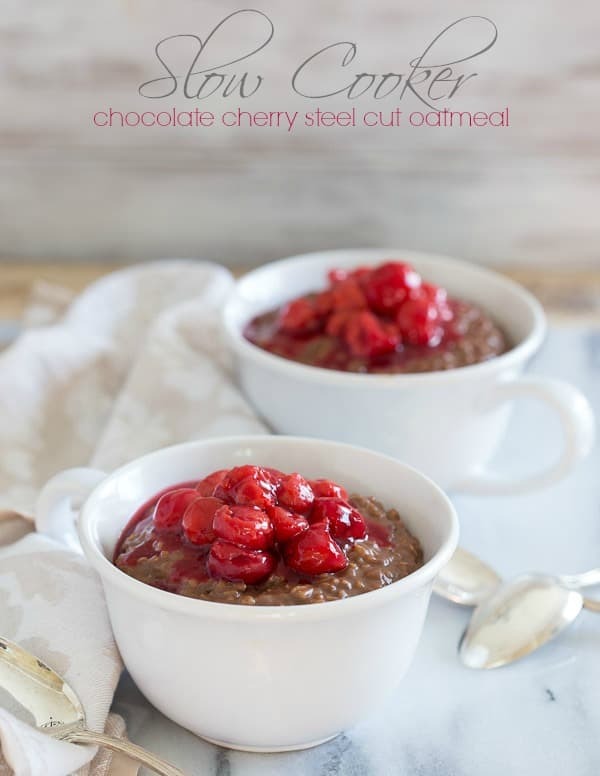 Loved this slow cooker chocolate cherry steel cut oatmeal recipe? 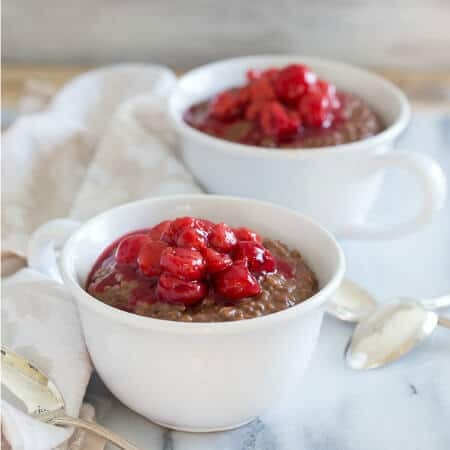 Try these other oatmeal recipes: Triple Chocolate Steel Cut Oatmeal, Baked Apple Oatmeal, and Instant Pot Sweet Potato Steel Cut Oats. Combine all the ingredients for the oatmeal in a 3 or 4 quart slow cooker (*see note) and stir together. Cover, cook on low for 8 hours the night before and set so that the slow cooker stays on warm after it's done cooking. In the morning, combine the ingredients for the sauce in a small sauce pot over medium-high heat. Bring to a simmer and let cook for about 7-10 minutes until thickened. Uncover the oatmeal, stir and add a bit more milk if it's thickened up too much. Spoon the oatmeal into serving bowls and top with the cherry sauce. If your slow cooker is larger than this, you will want to double the recipe so that the oatmeal doesn't burn as it will be spread too thin in a larger slow cooker. *This post is sponsored by the Cherry Marketing Institute as part of my ongoing partnership with them. All content and opinions are my own. You know how obsessed I am with slow cooker meals so this is right up my alley!! Wow, this is one delicious bowl of oats. Definitely not boring at all. Pinned. I love how much the dried tart cherries plumped up in the slow cooker. And what a gorgeous color! I love slow cooker oatmeal — and this is an amazing flavor! The cherry and chocolate combination is perfection. I’ve been trying to make at least one thing in my slow cooker every week but I haven’t tried a breakfast yet. This oatmeal looks like a great place to start! This looks so good! Love the cherry chocolate combo! I miss my slow cooker while I’m in school during the year! Ah! Whoa, this looks awesome! I ‘ve not thought to put cherries in my breakfast bowl like this, yum! Well hello there , delicious! Who wouldn’t want to wake up to this? We just made a slow cooker almond joy oatmeal and it was so good. I adore cocoa + oats!! I adore oatmeal and making it in a slow cooker sounds amazing Gina! I love the cherries too for added flavour! Well look at you totally making black forest oatmeal! This looks so good and I love the almond extract in it! Yum! I haven’t really thought about using the slow cooker for oatmeal, but I might just have to now! Totally digging this oatmeal, Gina. Those cherries, WHOA. I might have to make some just to eat straight from a bowl solo! Chocolate and cherries with oatmeal? I’m in heaven! There is hardly a better combination than chocolate and cherries, but I never thought to put them in oatmeal. Yum! I must try this immediately! I don’t use my slow cooker often enouh either… it always seems liek a great idea, but then i just never actually do it. This recipe looks amazing though – LOVE how syrupy those cherries are! I would love to do this but I’m a diabetic. That would send my blood sugar soaring. Not to mention that I am the only one that will eat it in my house. So if u make adjustments I would love to give it a try. Oats in a slow cooker is such a good idea! This looks amazing! Gotta love your post-workout oats! Can I use vanilla extract instead of almond extract? Of course! Will change the taste a little but will definitely still turn out fine. This looks soooo good! My slow cooker only has a high setting. Do you think 4 hours on high would work? Thanks! probably, I might add a touch more liquid as cooking oats on high tends to burn around the edges. If you can stir on occasion while it cooks, that would help too. With fall in the air, time to think about oatmeal, which I live preparing in the slow cooker. This recipe looks enticing, but can anyone name grocery chains that sell dried or frozen tart cherries? I’ve been looking unsuccessfully in the mid-Atlantic area for years – wish they were not so scarce! Dried are probably easier to find than frozen. I know Trader Joe’s always has dried in their fruit + nuts section if you have one nearby. If not – you can always find them on Amazon! This looks so good !